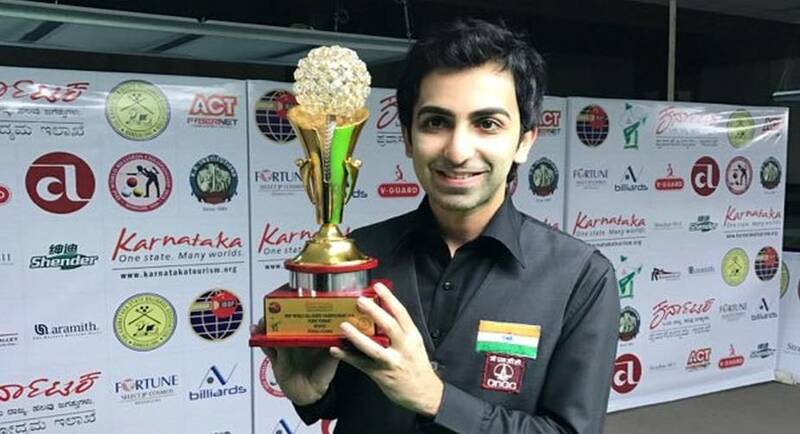 Pankaj Advani recently won his 12th World Billiards Championship title. India’s celebrated cueist Pankaj Advani, who recently won his 12th World Billiards Championship title, says he always comes up with his best when put under pressure. “My mom calls me a pressure cooker because I cook (play well) under pressure,” Pankaj said in an exclusive interview to thestatesman.com. The 31-year-old cueist from Pune outclassed Singapore’s Peter Gilchrist on Monday to claim his 12th World Billiards title, decorating his trophy shelf that contains 16 international titles, besides Arjuna Award, Rajiv Gandhi Khel Ratna, and Padma Shri, which he won in 2004, 2006 and 2009 respectively. “This is my 12th World Billiards title. I have won four IBSF World Snooker titles, too. Not in my wildest dreams would I have seen myself winning so many titles and creating records,” Pankaj said, when asked how he feels while looking back at his achievements so far. “I had never thought it possible to win world titles in all formats of billiards and snooker. I’m very thrilled to be the only person in the world to do so,” he added. The ace Indian cueist counts all his achievements as an honour and wants to keep India on top of world map through his heroics. “I want to keep the flag flying high and continuously put India on the world map in cue sport,” he said. Pankaj’s recent victory in Bangalore was larger than life for the Indian hero as it came following a roller-coaster ride amid a tough competition. Following a neck-to-neck clash in the final, Pankaj beat Gilchrist 6-3 [151 (98)-33, 150 (97)-95, 124-150, 101 (98)-150 (89), 150 (87)-50, 152-37, 86 (86)-150, 151 (110)-104, 150 (88)-15]. “It’s always awesome to win a major championship. I couldn’t have asked for a better ending to the year than winning a world title at home. That too, title No. sweet 16 in the year 2016,” Pankaj said, referring to his 12th title triumph. Pankaj also talked about the nervous moments in final, where he started well but then his opponent (Gilchrist) bounced back, winning two frames back-to-back and giving the Indian a tough hand in the first six frames. Despite being the lead protagonist in India’s success story in cue sport internationally, Pankaj has never received as much appreciation from his nation as a cricketer or a footballer receives after scoring a century or a goal respectively. “There’s a need to highlight the achievements/exploits of sportspersons in various disciplines impartially by media. The day the athlete becomes the pivot of the sports policy of the State and Country, is the day we will achieve true professionalism in Indian sport,” Pankaj responded on the worrisome state of the sport. Pankaj says he has recently seen a growing number in youngsters coming up for the game, though the federation still needs to take up a few steps, if wants to popularise the sport in India. “There are a lot of youngsters taking to the game now. We see more than a thousand participants at the National Championships every year. As far as the popularity of the sport is concerned, that is the responsibility of the Billiards and Snooker Federation of India.